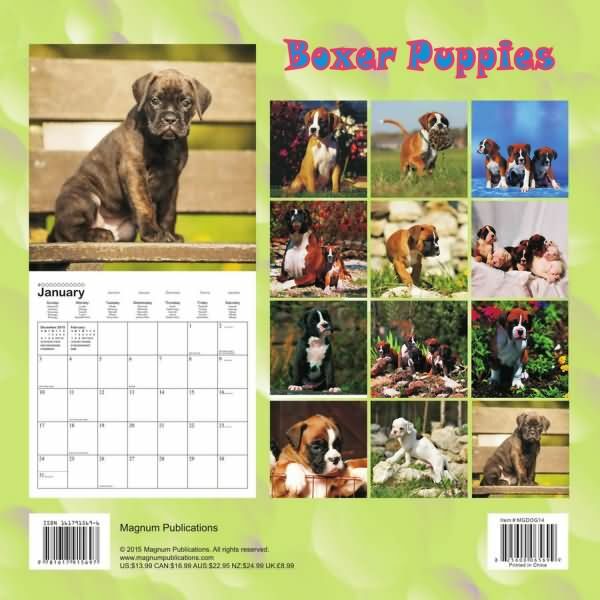 Each large format calendar features 16 months and 13 full color photographs with plenty of room to write special dates, birthdays and anniversaries on the calendar grid. 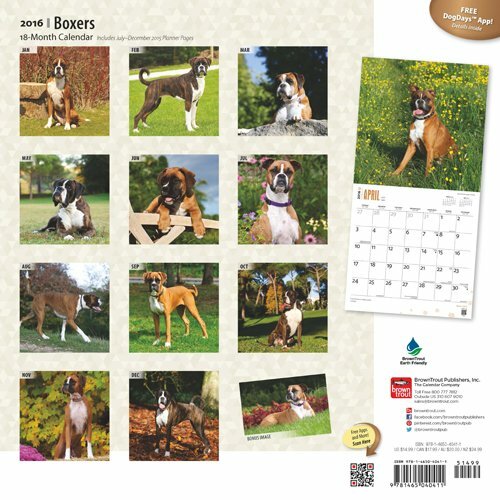 Cropped Boxer Dog Calendar: Each large format calendar features 16 months and 13 full color photographs with plenty of room to write special dates, birthdays and anniversaries on the calendar grid. 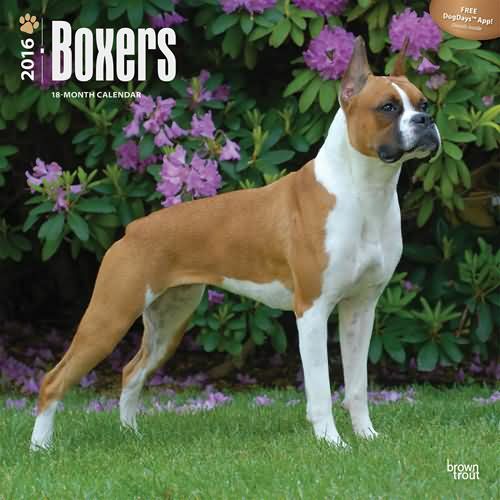 Alert, curious, and smart, the Boxer shows its emotions through its many distinct facial expressions. 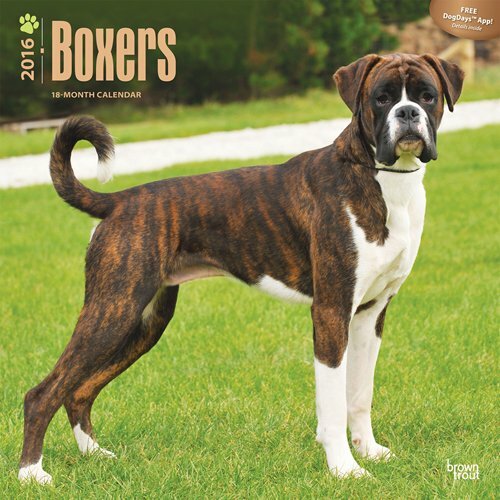 These strong and fearless dogs often have terrific clowning personalities. They learn tricks in a flash. Energetic yet patient, they get along great with children. 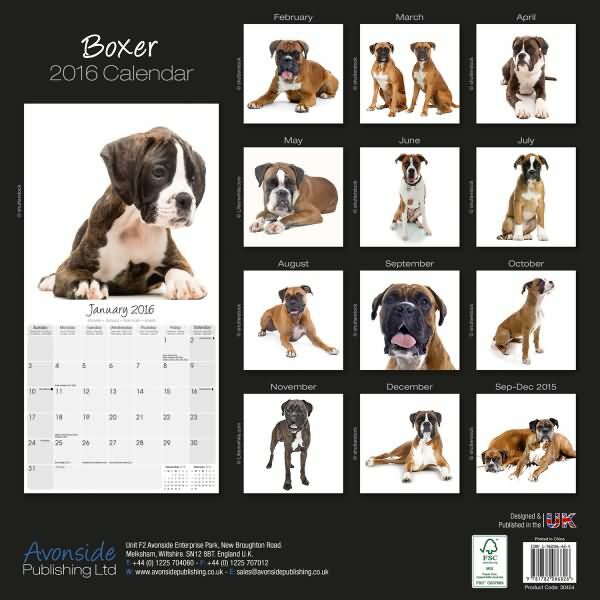 Fans of this amazing breed will enjoy this wonderful Boxer wall calendar. 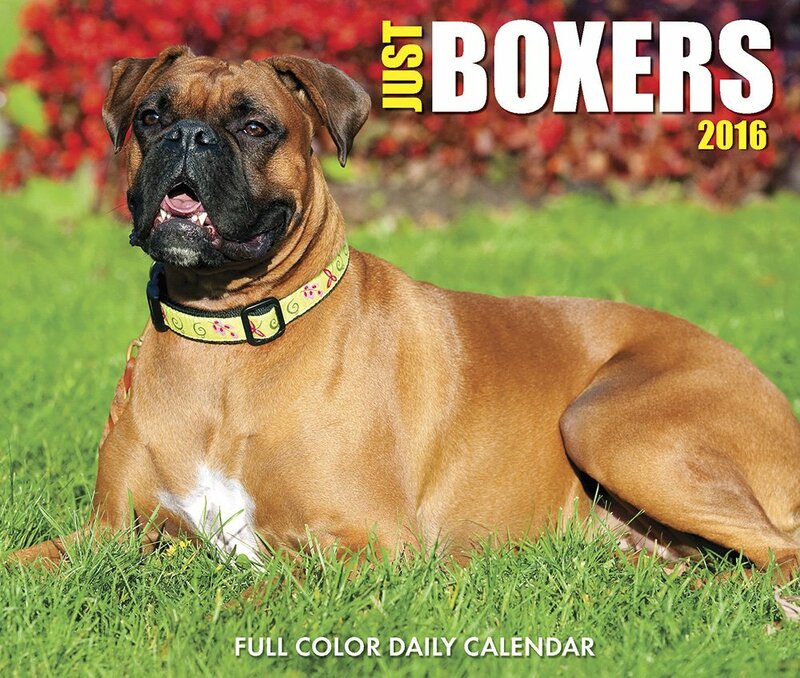 This calendar features 12 stunning full color photographs of Boxers and interesting facts. Published by Willow Creek Press. 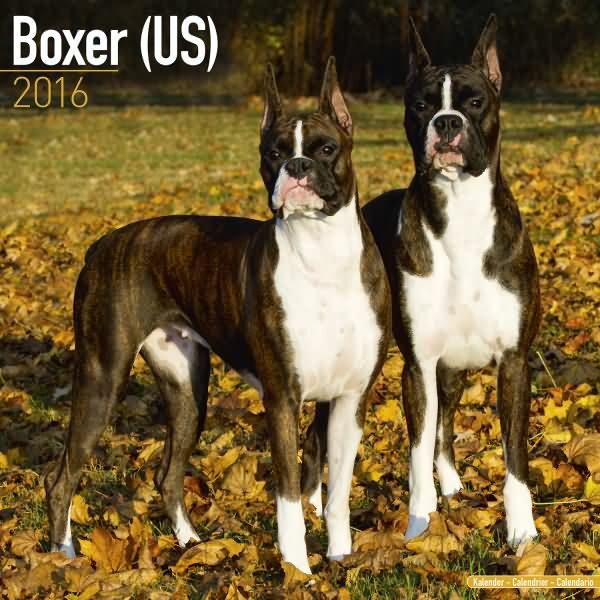 German in origin, the Boxer got its name from its tendency to "punch" with its paws when it�s in a tussle. 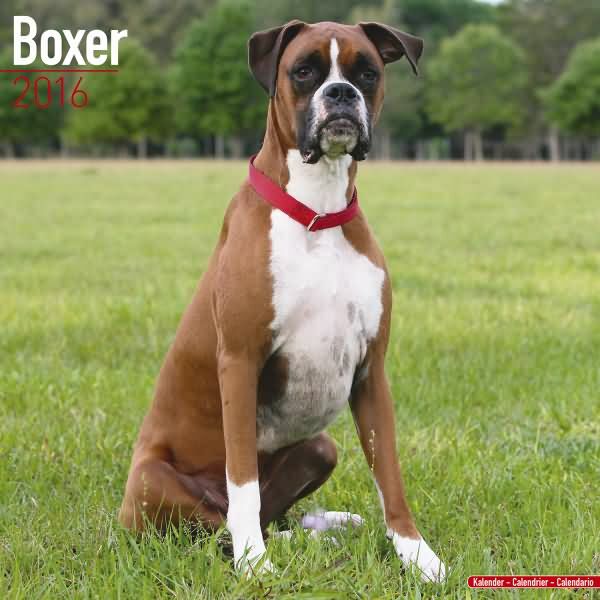 Strong, sturdy, and intelligent, the Boxer has an impressive resume as a working dog:herder, hunter, circus trickster, military guard, police dog, and the list goes on. 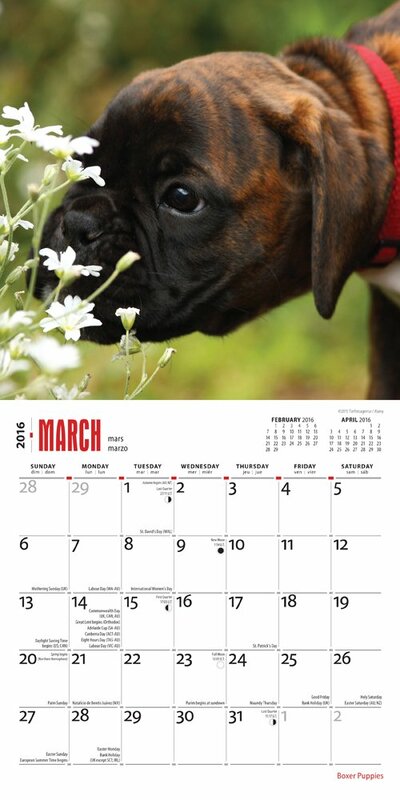 This dog is highly energetic; it loves to jump and can play for hours. It makes an entertaining and devoted companion. 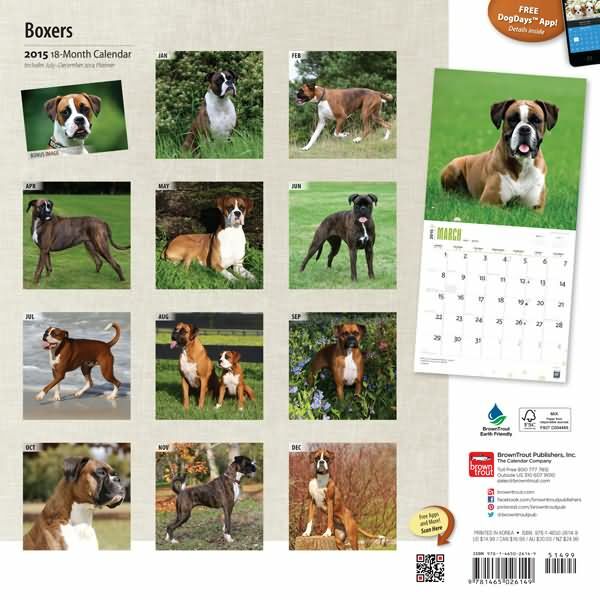 This deluxe edition calendar captures the true essence of Boxers, and it will delight any lover of this fabulous breed. 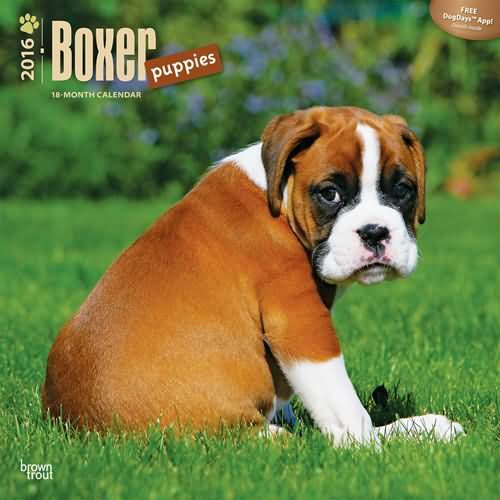 Boxer puppies are darling, intelligent, athletic, and social, all the lovely qualities of an adult boxer in miniature. 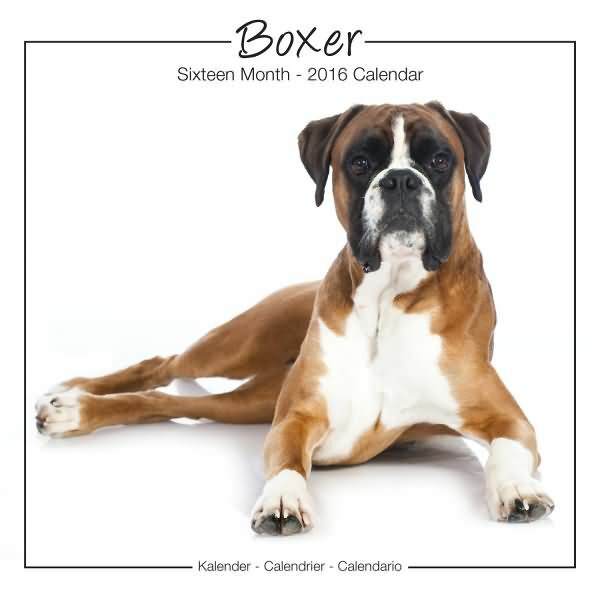 Spirited, yet even-tempered, a Boxer makes a fabulous pet. 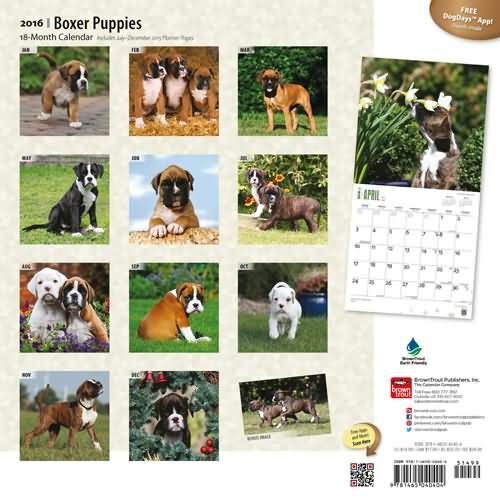 The bouncy Boxer Puppies in this wall calendar will grow up to be courageous and intelligent dogs. 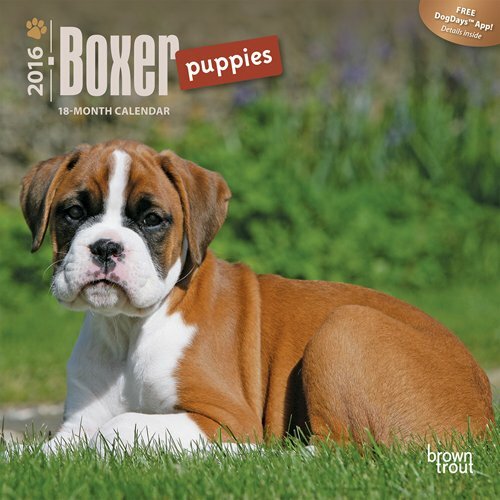 This calendar features 12 stunning full color photographs of Boxer Puppies and interesting facts. 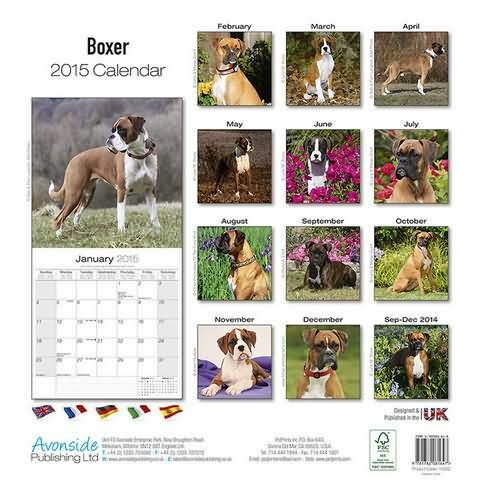 The Boxer was originally bred as a working dog in Germany. 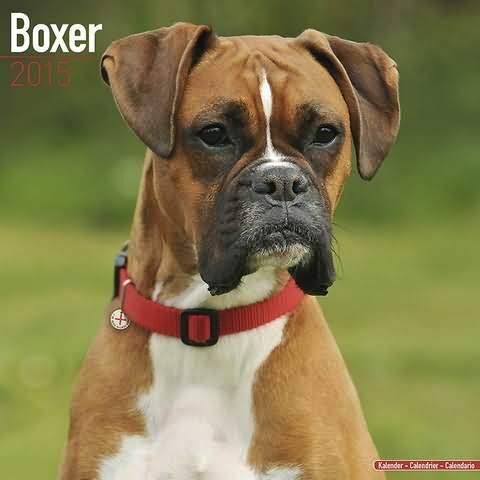 Curious and intelligent, the Boxer loves to play, and it especially loves to jump. These skillful dogs are also exceptionally adept at maneuvering things with their front paws. 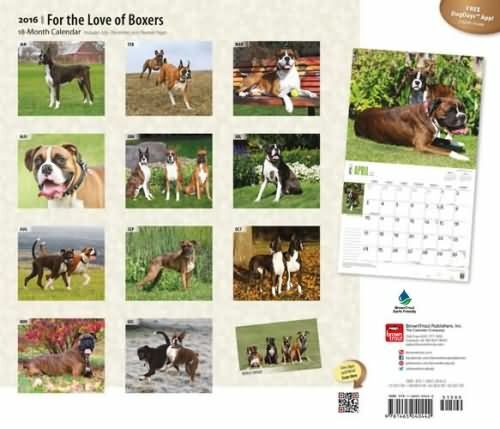 Alert, loyal, and affectionate, they make terrific companions. 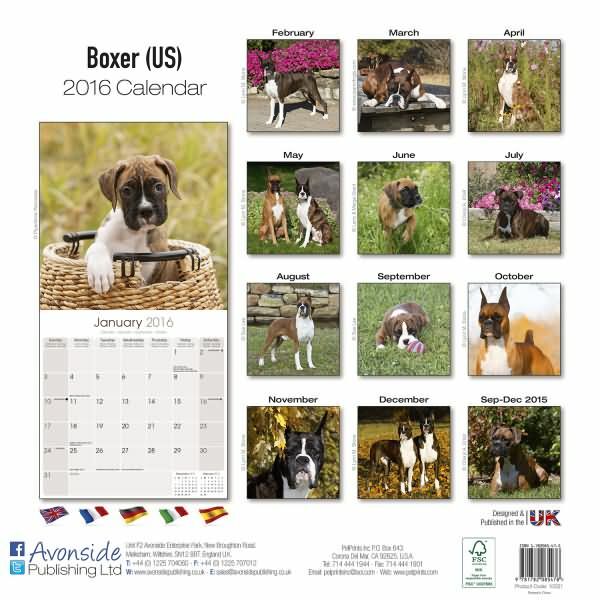 Boxer fans, you can plan your work and play in with this fabulous Boxers weekly engagement calendar. 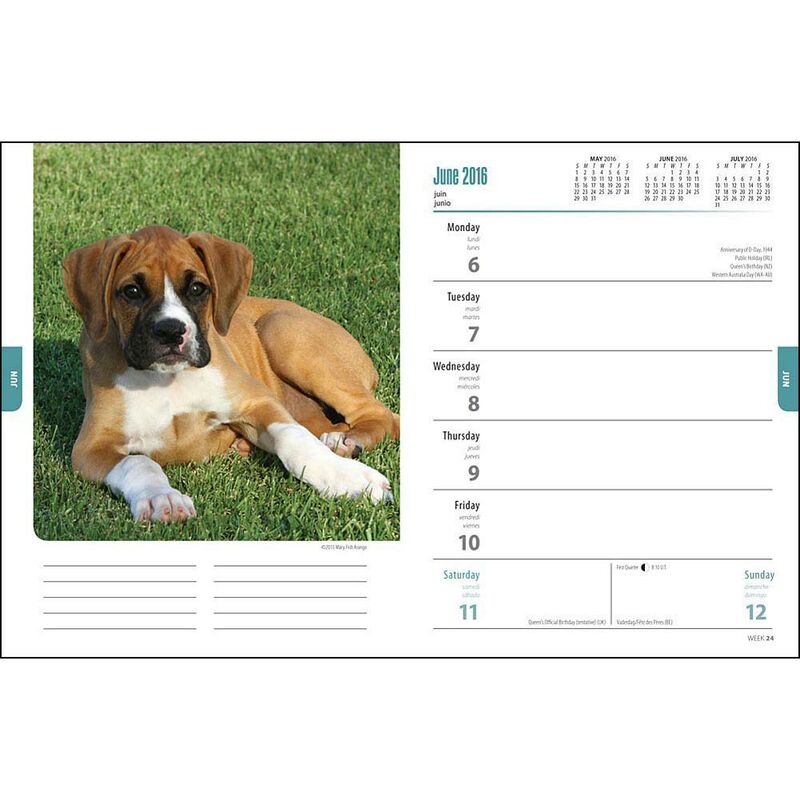 This wire-o bound hardcovered engagement diary measures 6.5� x 7.5� and features full-color images alongside planner pages for each week of the year. 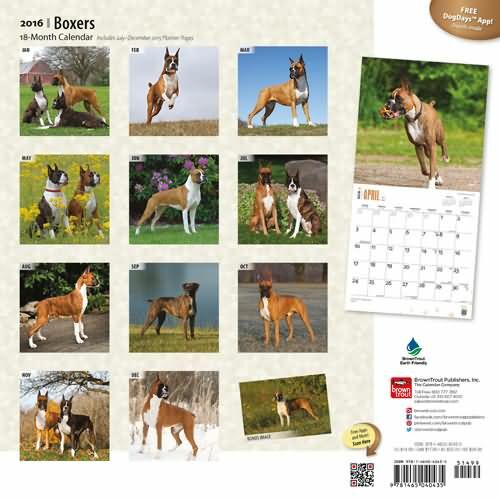 The calendar begins with a full-year calendarium and ends with a full-year calendarium of the upcoming year. It also includes several pages for personal notes. 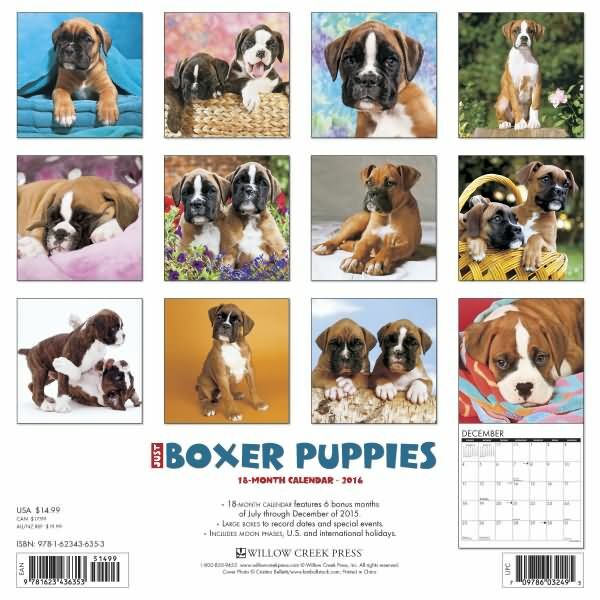 Boxer Puppies Mini Wall Calendar: Boxer puppies are darling, intelligent, athletic, and social?all the admirable qualities of an adult Boxer, but in adorable miniature. 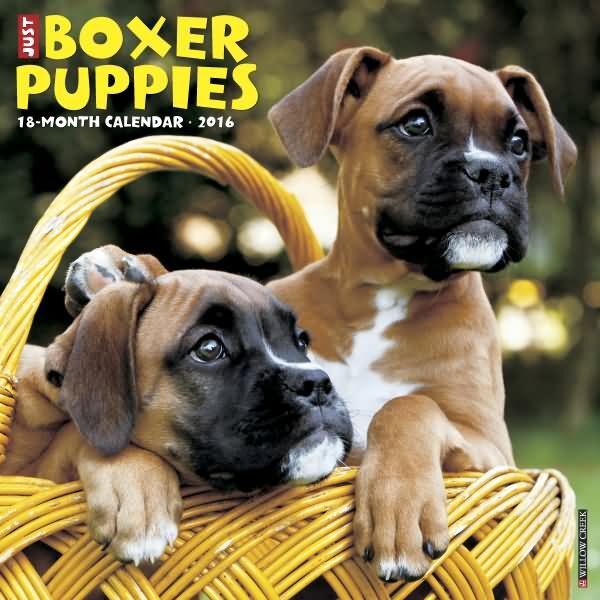 The bouncy Boxer puppies in this calendar will grow up to be courageous and intelligent dogs. 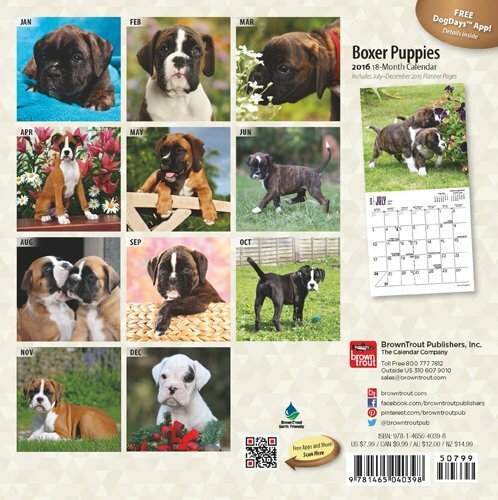 So enjoy their company as puppies with this delightful mini wall calendar. 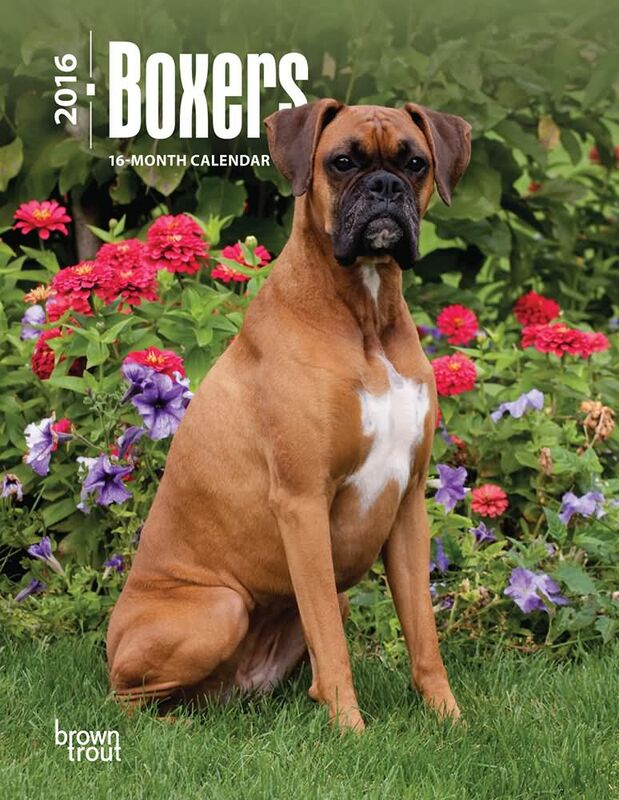 Includes a free download of the DogDaysTM; app for the smartphone and tablet, which grants access to the world?s most captivating dog photos and backgrounds, fun puzzles, and a calendar featuring your favorite furry friends. BrownTrout is committed to sustainability. 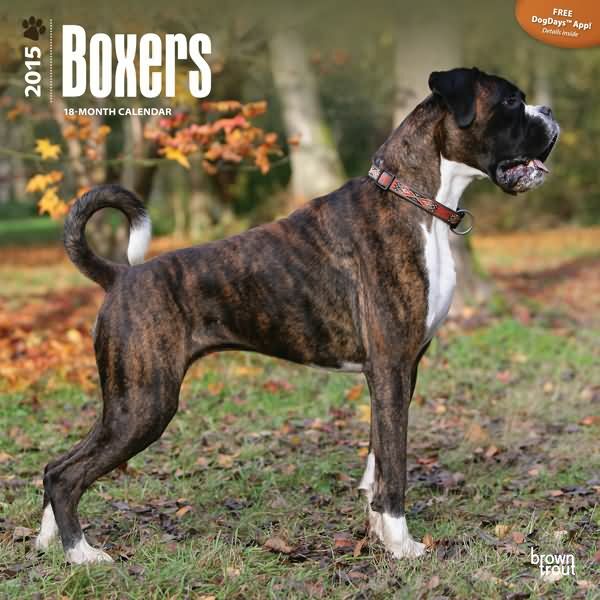 Boxers are strong and powerful yet loving, loyal dogs who want nothing more than to be close to their owners. 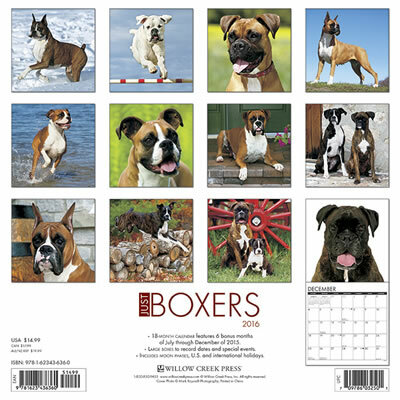 310 full-color photographs pop off each page to showcase all the unique charms and characteristics of these beloved dogs. 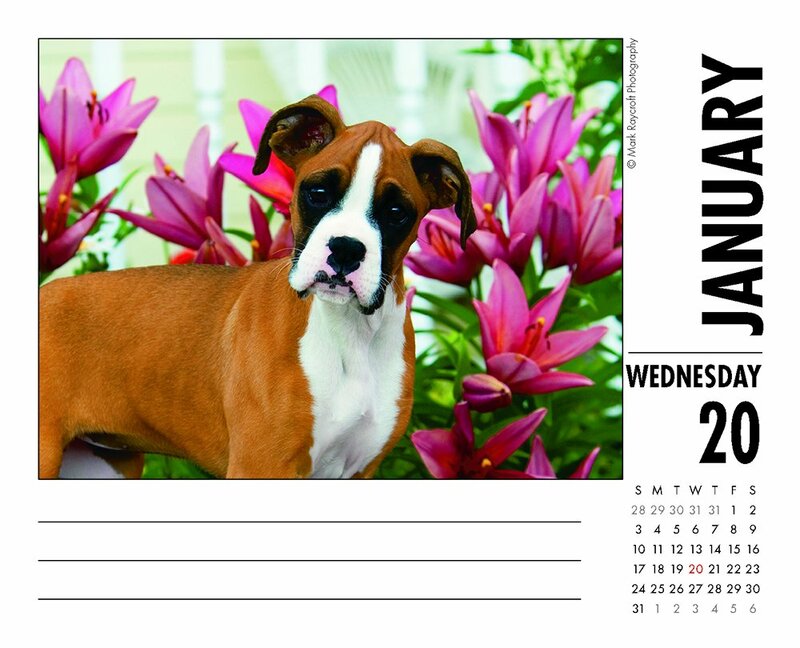 Each page also includes adequate space to jot memos, reminders and appointments. 18 Months of adorableness! Perfect for hanging in your kitchen to share. Plenty of space for appointment keeping to make sure your family is where they need to be. 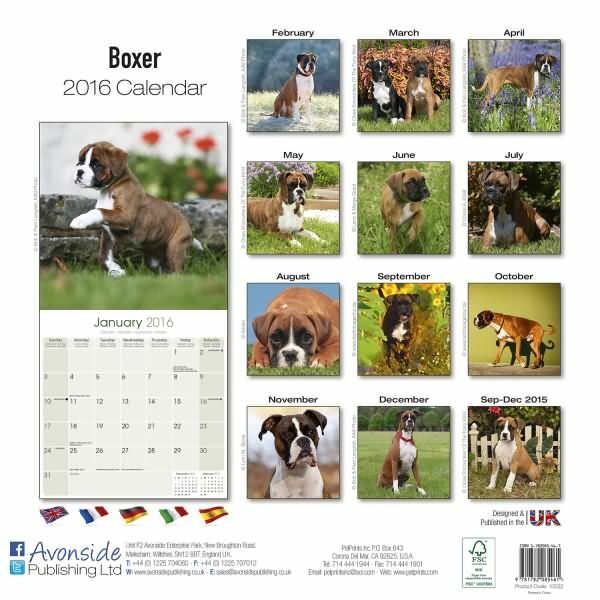 Great for any dog lover. 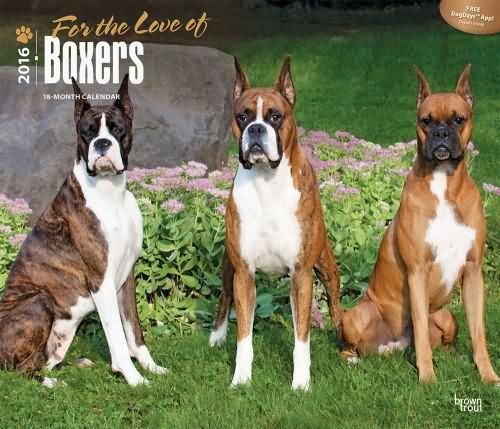 With its confident manner, playful, affectionate nature, and tremendous sense of humor, the Boxer is awfully close to being a perfect companion. Bright-eyed, intelligent, and friendly, they love children and are devoted to their owners. 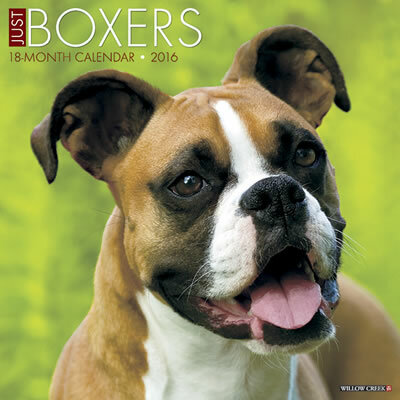 This international version calendar features photos of the Boxer dog with unclipped ears.